The following guidelines may differ from those provided by your local node operator. Direct connect is just like it sounds where repeater (node) "A" connects direct with node "B". With this type of link the two nodes are interconnected and no other IRLP connections are possible. While repeaters "A" and "B" are connected, anyone attempting to connect with either node will be told by a recording that - "The node you are calling is currently connected to callsign" however all local traffic on each repeater will be heard on the other repeater as well. While Direct Connect is preferred for a city to city chat, the most common type of connection in use today is via the Western Reflector (Ref 9250). A reflector is a Linux computer that is not connected to any radio but rather sits on lots of internet bandwidth capable of allowing many repeaters to be inter-connected together by streaming the received audio back to all other connected stations. Each reflector has 9 sub channels allowing up to 10 separate virtual reflectors to operate. These are identified by the last digit. For example - 9250 is the main channel with 9251, 9252 9253 etc being virtual reflectors with identical capability as the main channel. You can always check which stations are connected to the reflectors main and sub-channels by visiting http://status.irlp.net and looking for nodes connected to individual nodes or reflectors. Due to the slight increase in delays created by multiple Tone Squelch radios in the links between the repeater and IRLP link radio, a slight change in our normal operating procedures is required with IRLP. The most important guideline to remember is leaving a pause after pressing the PTT button as well as between transmissions. Avoid local traffic while connected to the reflector. By its nature, the reflector has a large footprint and a wide audience, therefore if local users would like to have a discussion, they should disconnect from the reflector. If we hear a local conversation (all participants coming from the same node) that continues, I, or one of the other reflector control ops will likely ask them to disconnect. If attempts to break into the conversation are unsuccessful, the node may be blocked from the reflector (more on blocking later). Along the same line, if two stations become engaged in an extended dialog involving only themselves, then I would recommend they both move off the reflector and make a direct node to node connection, freeing up the reflector for others. If more than two nodes are involved, then moving to one of the lesser used reflectors might be an alternative, especially if one of the stations can check the web site for an available reflector. In the future, moving to one of the available sub-channels will become an option. It IS acceptable to call CQ, in fact, if you really want to make a contact, it is preferable to say "This is K9DC calling CQ, is anyone available for a contact?" as opposed to "K9DC Listening" ...silence for 2 minutes, followed by a disconnect. However 3 x 3 x 47 CQs are unnecessary and should be left for CW/SSB frequencies where tuning around is the observed practice. Odds are we heard it the first time. It IS acceptable to talk about the weather, or anything else that is geographically significant. But like anything else, within reason. A station in Indiana that says to a Colorado op, "Hey I heard that you have a mountain out there" will probably cause eyes to roll worldwide. In general though, long winded, channel consuming conversations should be avoided. Remember there are usually a dozen or two connected systems, with perhaps hundreds of users that might like a chance to use the system. Listen first. When connecting to the main channel on a Reflector, odds are that you are dropping into an existing conversation. Wait for at least 15 seconds to make sure you are not interrupting an existing QSO before calling. Pause between transmissions. Many nodes are connected using simplex links, therefore the only time it is possible for them to disconnect is between transmissions. Be sure to pause AT LEAST 5 seconds between transmissions. Key your transmitter and wait before speaking. There are propagation delays across the Internet, as well as delays caused by sub audible tone decoders and other devices that cause a delay before the audio path is cut through. If you speak immediately upon PTT, the beginning of your transmission will not be heard. IRLP reflectors have a management function allowing reflector control operators to block specific nodes from accessing the reflector. When a node is blocked, the reflector ALWAYS automatically generates an e-mail message to the e-mail address of the Node owner as submitted to database irlp.net. The e-mail should contain the specific reason for the block. This blocking is NEVER personal. It does NOT mean that we don't like you, but is only done to ensure continued operation of the reflector. Even my own node has been blocked. Nodes are usually blocked for a technical malfunction, such as a locked COS, open squelch noise, extended hang time, or your repeater ID (with no user traffic) or courtesy beeps audible to IRLP, or any other problem that that impairs operation of the Reflector. Your node may also be blocked for rapid fire local traffic making it impossible for nodes to break in between transmissions. The reflector control ops may try to contact a local control op on the air to advise the problem, however this may not always be possible. It is important that the node owner respond to the e-mail message advising the problem has been corrected. If you have any other specific questions I can address, please send them along. First of all listen on your local machine for at least 15 -30 seconds before transmitting and then ask if the repeater is currently in use. Assuming all is clear, identify your self and give the node name or number you wish to call . Example: "VE3xyz for the Sydney node" - - then enter the ON code for the node and release your PTT. Your local repeater should come up with a carrier as it waits for the connection to be authenticated. This can take a few seconds of dead-air so don't be concerned. When the connection is confirmed, the voice ID of the destination node will be transmitted back to you as well as your nodes voice ID to the other repeater. NOTE: If your node is already connected to another node or reflector, a greeting will play saying; - "your node is currently connected to...ID of the connection") In this case confirm if anyone desires the connection to remain up before dropping by using the OFF code..
Press and hold the microphone PTT for a second and then announce your presence and your intention such as you are calling someone specifically or just looking for a QSO with another ham in that city. If no response is heard, announce your call and your intent to drop the link and then touch- tone in the OFF code. Not a good idea to transmit touch-tone commands without first giving your call-sign. Not only is this courteous it is a regulatory issue in some countries who may be connected to the reflector. Some nodes are configured so you cannot connect to them if that repeater is active. In this case you will receive the message "The node you are calling is being used locally" If you receive this message wait 5 or 10 minutes and then try again. If you stay connected to a node and there is no activity on your repeater for 4 minutes, the connection will time out and automatically disconnect with a voice ID disconnect message on both nodes. WHAT ARE THE NODE CODES? This is a very common question to which there is no single answer. Some node operators choose to add a prefix to their node. Also some nodes require membership so the easiest way to get current codes is to contact the node operator or custodian. To email a node owner go to http://status.irlp.net, find the node you wish to contact and click on the node number. A link to create an email message is presented. As above, listen to your local machine for local use and then announce your intention for the Reflector before keying the ON command. When you hear the confirmation ID always WAIT at least 15 seconds before transmitting as you are most likely now connected with many repeaters and a QSO could be in progress. If after 15 seconds you hear nothing, identify yourself and indicate you are listening to the Reflector from "City and, Prov./State, Country". With the world wide IRLP activity your local repeater now has world wide coverage thus the suggestion to better detail your QTH. Don't be in a hurry to hear someone come back to you. You may have to do a bid of pleading from time-to-time to dislodge someone from whatever they are currently involved with. By default, connections to the reflectors now time out with no activity however many node owners set this period for a long period so it is not unusual for repeaters with minimal traffic to stay connected to the Reflector for extended periods of time. When or if the node times out from a Reflector connection a standard time-out greeting will precede the timeout saying, "Activity time out ... Reflector xxxx, link off"
If you hear or wish to engage in a prolonged rag-chew on your local repeater (long discussion of a local nature) out of courtesy to other node listeners drop the reflector. Many users of IRLP express desires to exchange QSL cards. With many IRLP users not being on HF they may have never considered having QSL cards printed. Now here is a new Internet technology for you to easily exchange QSL cards. eQSL is a new electronic QSL service that allows you to custom design your own card which is then formatted with your contact info and automatically sent to your contact. 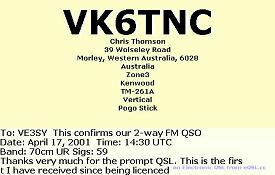 (see the card that I received from Chris VK6TNC from Morley, Western Australia.) While this eQSL generated card is plain, you are able to create your custom card from many graphical templates provided or upload your own graphic (see thumbnail of mine here) to the eQSL web site. This graphic is then used to automatically generate all of your outgoing cards with the contact info like we see on Chris's card above. The eQSL web site is http://www.eQSL.cc You can check right now to see if you already have cards waiting by placing your call in the form and pressing Search. The eQSL service is free supported by some advertising and private donations. Of course there is nothing like getting a real QSL card via the bureau or direct. If sending cards direct your remember that your local postage is not valid outside of your country so include a US dollar bill or an IRC to cover return postage.